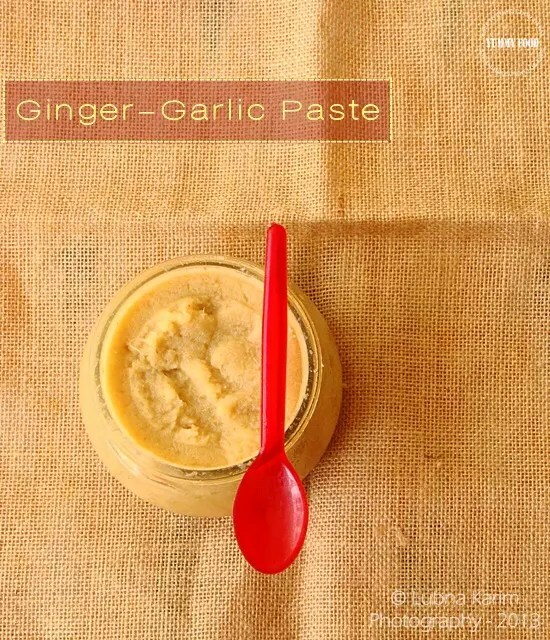 Most or almost every non vegetarian recipe is incomplete without this ginger-garlic paste. The pungent smell coming from ginger-garlic erases the raw smell coming from meat. So ginger-garlic paste is a must in most of the Indian non vegetarian recipes. Both ginger and garlic are loaded with medicinal and culinary values. Ginger/Allam/Adrak was found to be effective for relieving the severity of nausea even in cases of pregnancy. It is a great mouth freshener and ginger tea has vastly refreshing properties. Garlic/Chinna ulli/Vellulli/Lassan (Lehasun) – A single bulb of garlic a day, keep diseases away. Use two raw garlic daily to reduce the risk of cancer, due to its Anti-Carcinogenic properties. My mom always make half kilo of this fragrant Ginger-Garlic Paste, every month and store half of it in fridge until use. The rest half is stored in glass air tight container to retain aroma and freshness. Ginger is peeled, washed, cut into 1’inch pieces and then sun dried or dried under fan for 2-3 hours before grinding. Garlic cloves are peeled, washed and patted dry before grinding. Grind ginger pieces to fine paste and then add garlic cloves. When the paste gets soft enough add salt and pulse for 1 minute. Take out in an clean and dry airtight container and store in the fridge for future use. Apply coconut oil to your hands if you feel burning sensation after peeling and cutting the ginger roots. Adding salt increases the shelf life of Ginger-Garlic paste. This paste can be stored for 1 month. 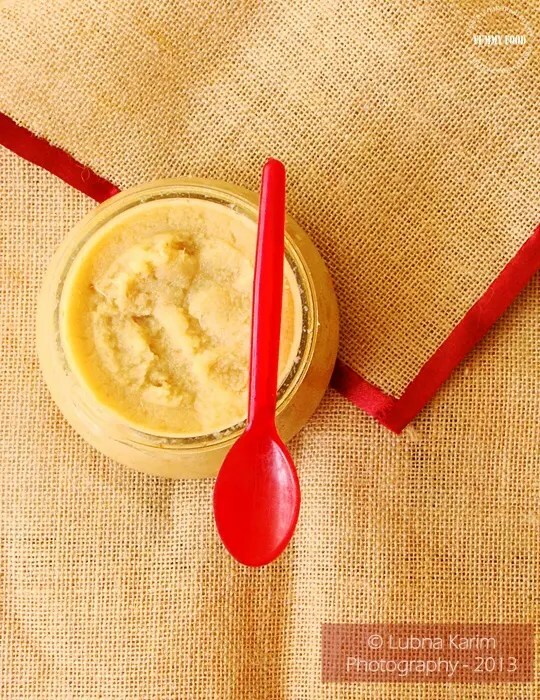 Use plastic or glass bottle to store this paste. Always remember to use clean and dry bottle to store the paste. good post..I used to make this along with green chillies too.. Simply superb…will be useful for everyone, splly for the peoples who were living abroads…i do the same too.. This is such an important ingredient in cooking.Good one. initially I bought the ginger-garlic paste from stores but I started developing an aversion towards the smell (preservatives) and am a very cautious cook so I used to make them separately and store them since American mixers dont co-operate with small quantitie… Then when I came across this Garlic press I stopped making thoese pastes and storing rather make them. I have a question Lubna, my brother-in-law told me he would use vinegar so they dont change color is it so??? 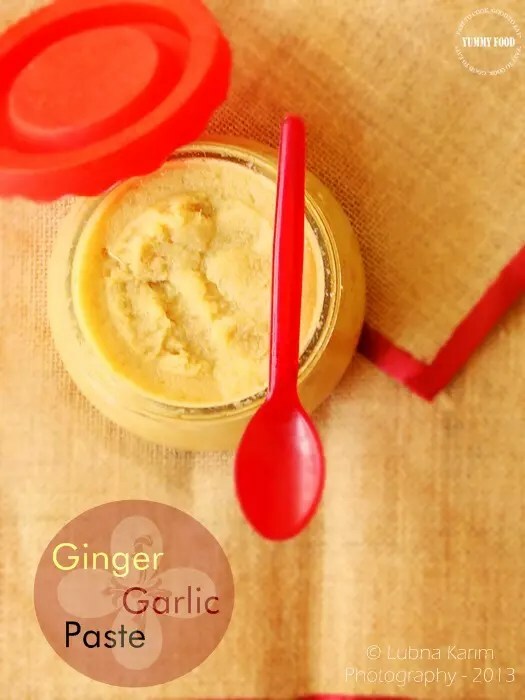 useful info on garlic and ginger.. i am also lazy to grind the paste, i just chop finely and put in everything.. of course, ginger garlic paste is the best! useful post. Good one Lubna. Thanks for sharing method for home made ginger garlic paste,its very useful! Thank you Sowmya, Priya, sameera, Deesha, Rosa, Yasmeen, Neema, Ramya, Mahimaa, Curry Leaf, Ning, LG and Rak’s Kitchen.